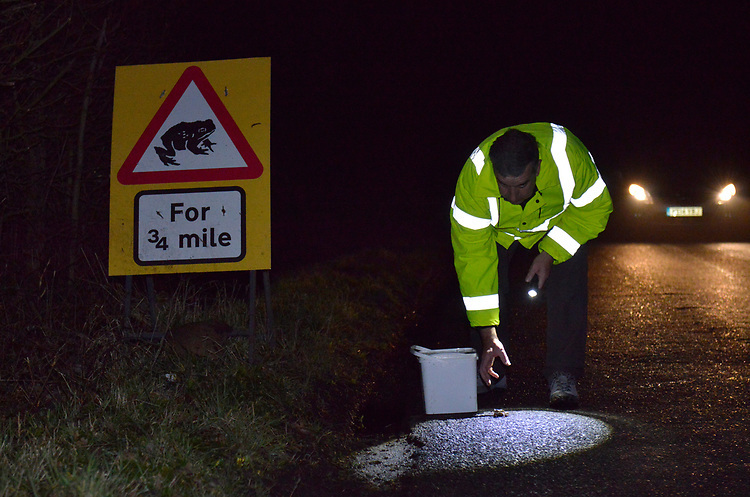 Toad Patrol on a busy Hampshire lane. In early spring every year, thousands of toads, frogs and newts migrate from their hibernation sites to breeding grounds. These journeys often involve road crossings and many are killed by unsuspecting motorists. With awareness of this major problem growing, volunteer groups are now a common sight in known hotspots, helping to reduce the casualty numbers by slowing traffic and collecting these animals from the road.